From J. 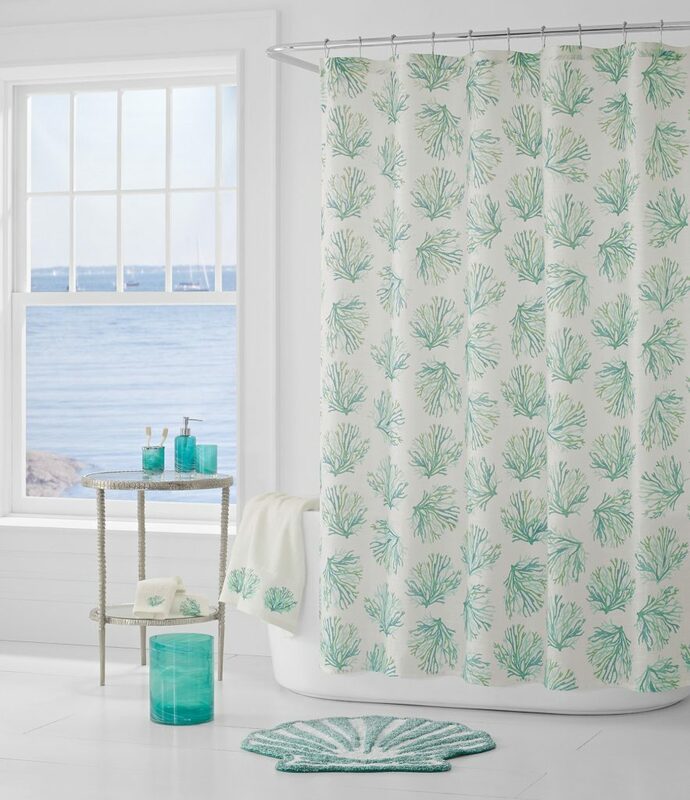 Queen New York, the Coral Reef Shower Curtain features a printed design in a fun and contemporary coastal pattern and an ombre of colors to compliment the textured cloth. Machine washable. (Coordinating accessories available here.) $39.99. Buy here. 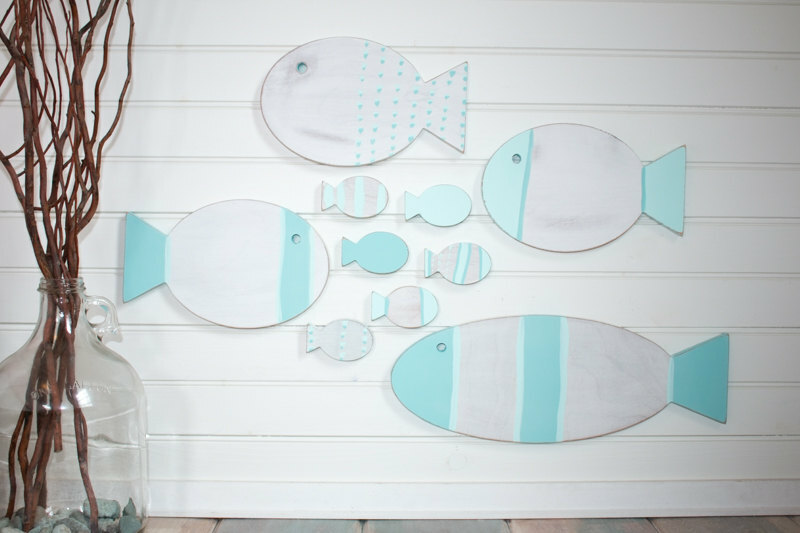 This set of ten Turquoise Wooden School of Fish, distressed and hand painted is perfect for your nautical home, beach house, nautical nursery, or beach cottage. Includes 6 miniature, 3 small and 1 large fish. $65. Buy here. Cute meets cozy with this Turquoise Organic Sweater Romper, Hat, Bootie and Blanket Set by Baby Cat & Jack. This adorable coordinated set is made from 100% organic cotton fabric that’s gentle on baby’s soft skin. The set includes a long-sleeve coverall, a bear hat, booties and a baby blanket. $39.99. Free shipping. Buy here. 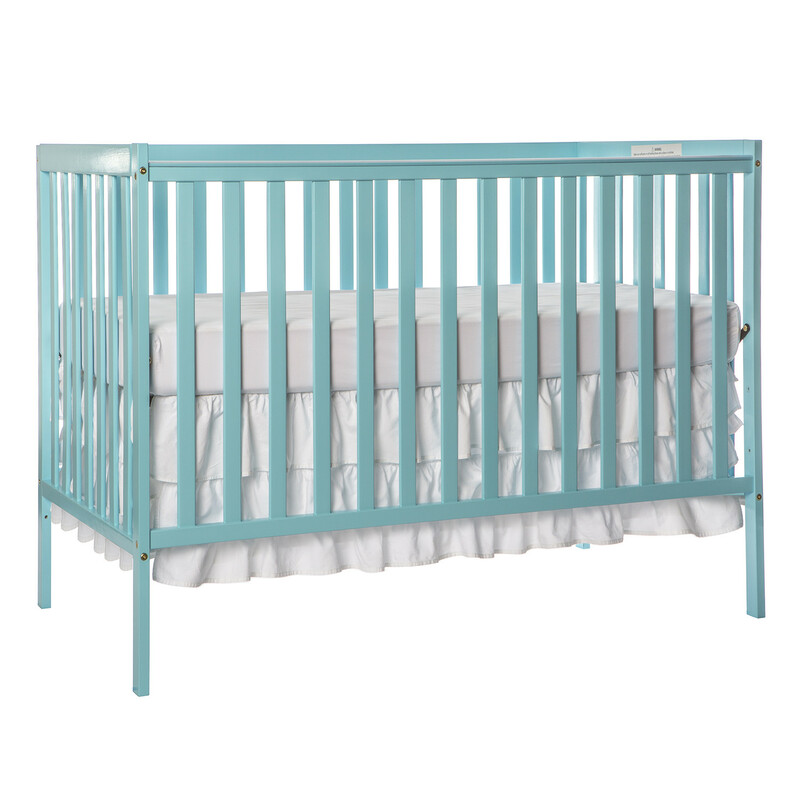 This Aqua Sky Synergy 5-in-1 Convertible Crib coverts into a toddler bed, a daybed and full size bed. 4 Position mattress support system. Solid pine wood finish. $135.99 Sale $121.99. Free shipping. Buy here. 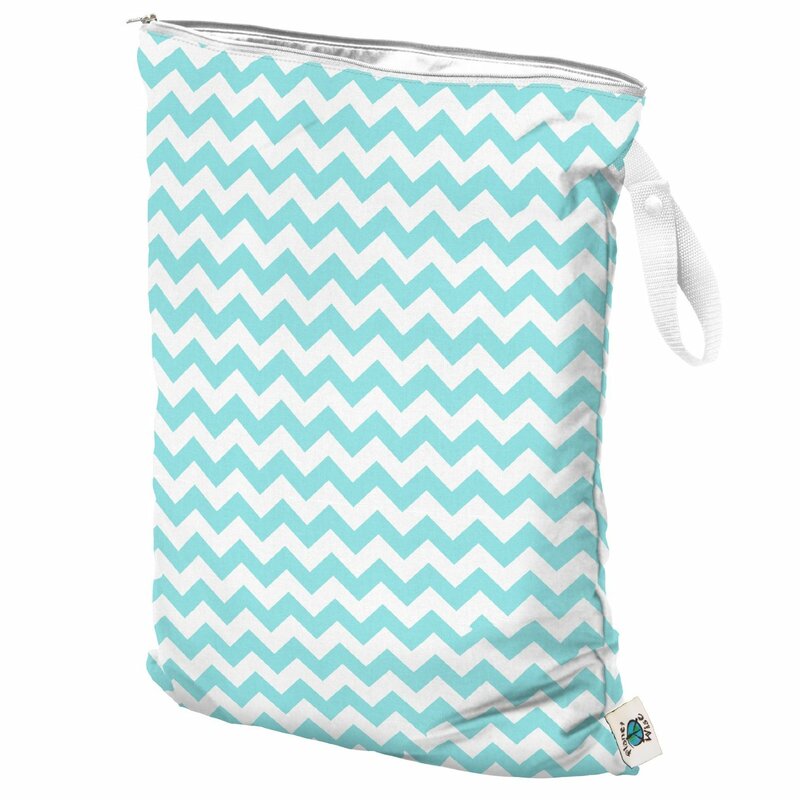 These machine washable, waterproofÂ Planet Wise Teal Chevron Wet Bags are perfect for carrying your wet and dirty items. Planet Wise wet bags are innovatively sewn with hidden, sealed seams for no leaking. Planet Wise wet bags also resist most odors and stains, keeping smells in. 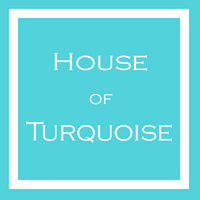 Perfect for cloth diapers, swimsuits, travel or laundry! In 3 sizes. $9.50-$18.95. Buy here. A comfortable rocker is a necessity for feeding, playing and bonding with your baby. 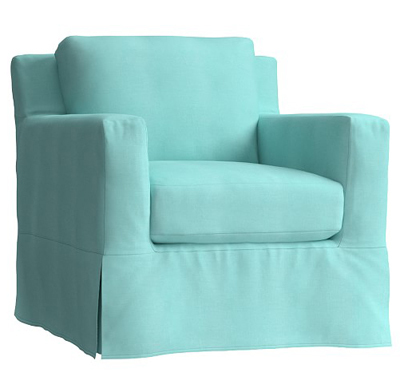 When you no longer need this Aqua Comfort Swivel Rocker in your nursery, simply update it with a new slipcover for a welcome addition to your living area. $1,099 Sale $999. Buy here. 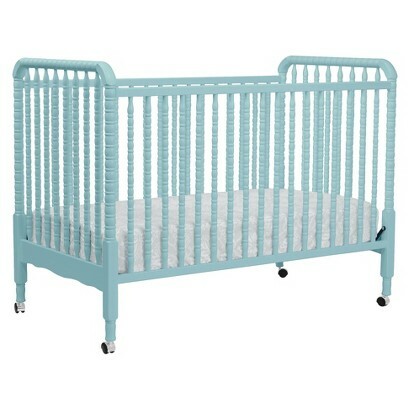 This DaVinci Jenny Lind 3-in-1 Crib in Lagoon will be a sweet addition to any nursery.Â With its signature intricate spindle posts, stationary sides, and optional wheels, the Jenny Lind is constructed with the newest and most stringent safety standards in mind. Also converts to a daybed and toddler bed. $249.99. Buy here. 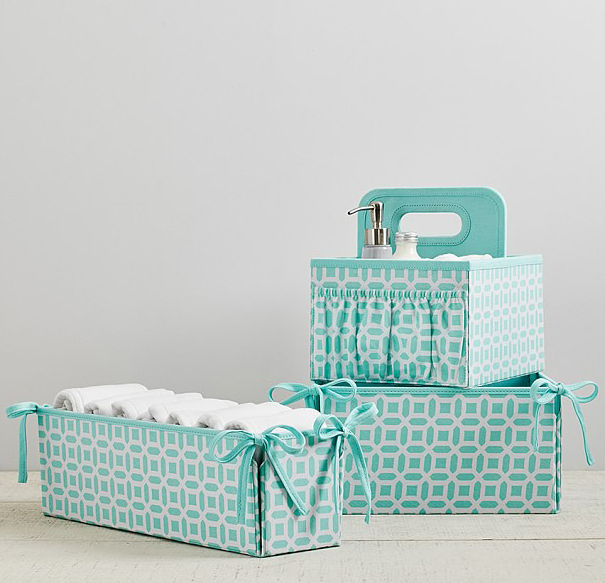 This Aqua Blue Geo Nursery Storage will keep you organized. With a handle on top for easy toting and a pocket in front for accessories, the boldly patterned caddy holds diapers out of sight and close at hand. $29-$36 Sale $23-$28.50. Buy here. 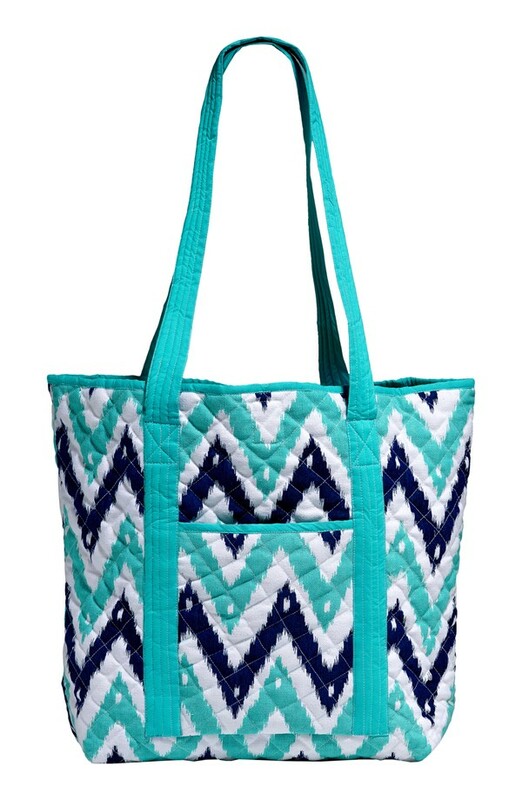 Perfect for a day out, the roomy design of thisÂ Turquoise Chevron Quilted Tote features plenty of space for toys, clothes or a blanket, and also easily doubles as a beach bag. Made of 100% cotton. $44 Sale $34.84. Free shipping. Buy here. 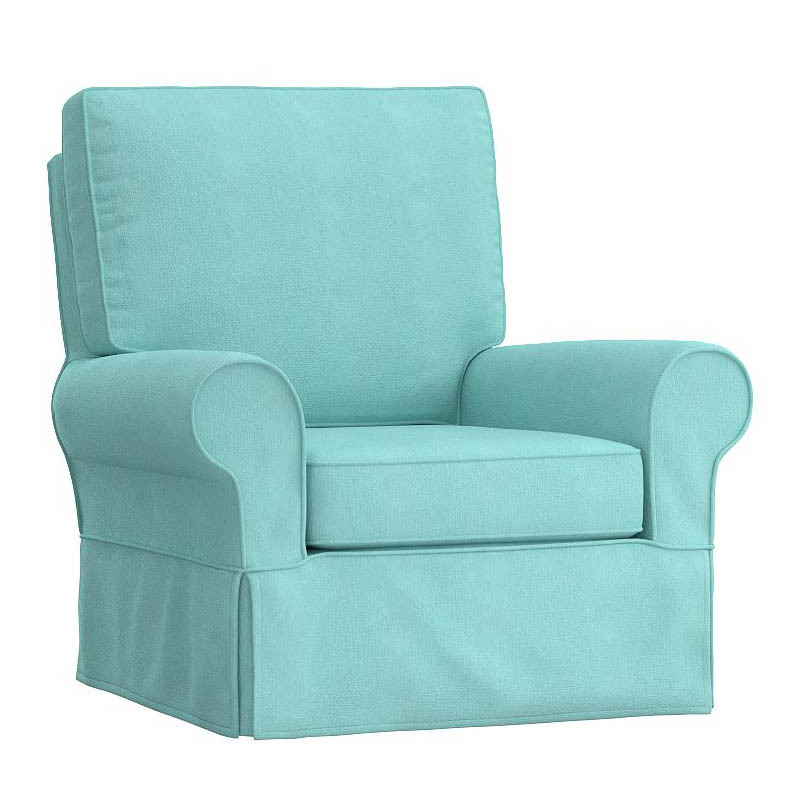 Classic and comfortable, thisÂ York Aqua Slipcovered Glider provides soothing rhythmic motion for your baby to drift into a peaceful slumber. The simple lines and waterfall skirt impart a casual, relaxed feel. $1,199. Buy here. At first glance, the Custom Nottingham Upholstered Glider looks like a tailored armchair featuring beautifully curved arms and a rolled, tufted back. But this stylish nursery glider is also designed to glide and swivel 360 degrees. 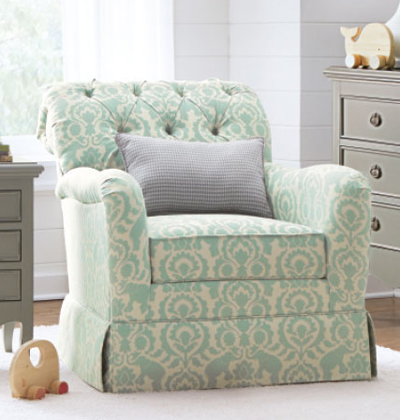 Choose from a variety of beautiful custom fabrics and create a chair that will go from the nursery to the living room with ease. Shown in Babar Serenity. $699 Sale $559. Buy here. 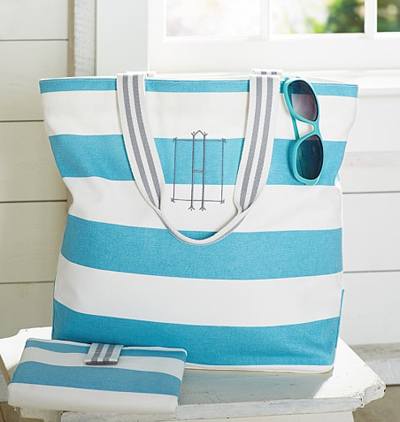 A simple profile in a sporty print makes this Aqua Rugby Stripe Harper Tote the perfect everyday bag for storing your babyâ€™s essentials. Sewn of pure cotton canvas. Features an interior zipper pocket and two exterior side pockets. Magnetic bridge snap closure.Â Personalization available. $49.50. Free shipping. Buy here. With its supportive lumbar pillow and sides that slope into curved arms, this Aqua Declan Rockerblends supreme comfort with enduring style. 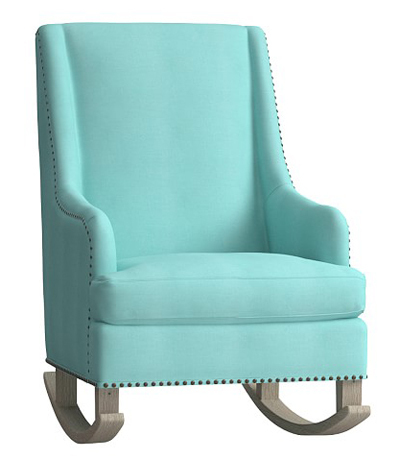 A T-shaped cushion and nailhead trim add definition and interest to the silhouette. $999. Buy here. 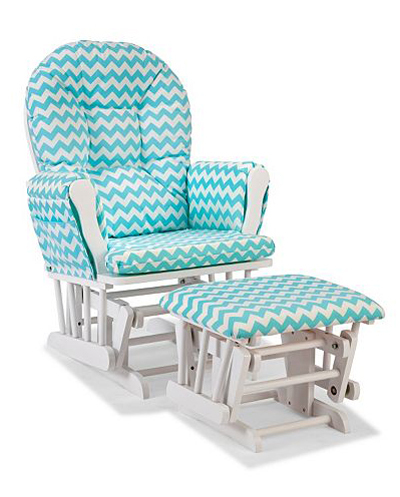 You and your little one will love spending time in this Stork Craft Chevron Hoop Custom Glider Chair & Ottoman Set together. Features smooth & soothing gliding motion, a side pocket to keep essentials close and durable, easy to clean microfiber cushions. Includes chair & ottoman. $189.99. Buy here. Calming, warm and luxuriously soft, theÂ ChappyWrap Mini Sheep Blanket is made with cotton! Wrap your little one in the sublime warmth ofÂ ChappyWrap’s signature cotton rich jacquard weave, produced by expert craftsmen using only the finest materials, for a comfortable and cozy feeling you won’t want to live without. Measures 30″ x 40″. (Design also available in a large 60â€ x 80â€ size.) $50. Buy here. 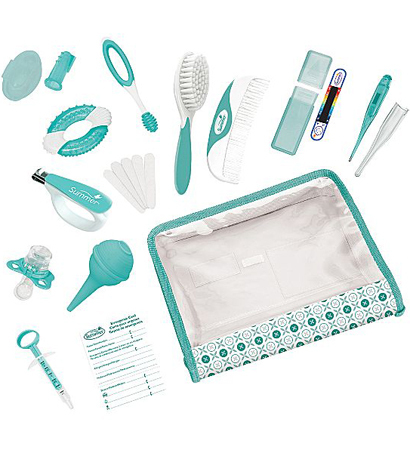 This 21 piece Summer Infant Complete Nursery Care Kit includes essential items for a newborn, all packaged in a handy storage case. Makes a useful, appreciative shower gift. $24. Buy here. Keep your young one cozy, comfortable and surrounded by pretty paisleys. 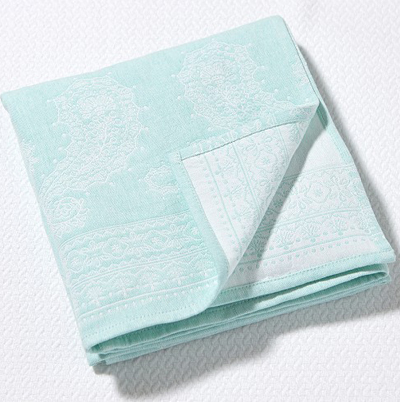 This Aqua Paisley Stroller Blanket is an everyday essential that provides a soft layer of warmth. $39.50 Sale $22.99. Free shipping. Buy here.